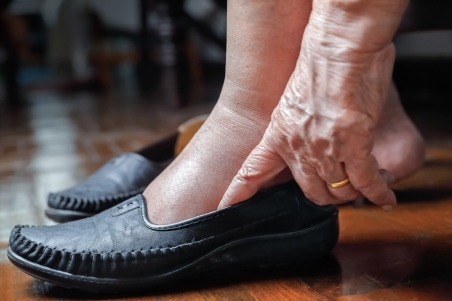 Older adults are more prone to problems with their feet. Common age-related changes include bony deformities such as bunions, hammer and claw toes. Your feet could become uncomfortable and painful decreasing your mobility and independence. If your feet are painful, swollen, or you have foot problems such as corns and calluses, you may benefit from seeing a podiatrist. Podiatrists are health professionals who specialise in foot care, and can help with things like nail care, skin problems or adding padding or support to your shoes to help with comfort. Problems with your feet can affect your mobility, balance and increase your risk of falling. It's important to look after your feet. looking for signs of infections. See your GP if you are concerned. General information about feet, foot care, and footwear. Information and tips about foot health in older people. Age UK – Fitter feet, retrieved June 2018. Podiatry New Zealand – Common foot problems, retrieved June 2018.